Per unit of energy, oil and especially coal are much more dangerous than nukes. Image: Seth Godin. With all the focus on the situation in Japan, it’s easy to forget that global society’s biggest source of electric power, good old fashioned coal, is pretty dangerous stuff. And with the anniversary of the Deepwater Horizon spill coming up next month, we should remember that oil’s pretty dangerous too. 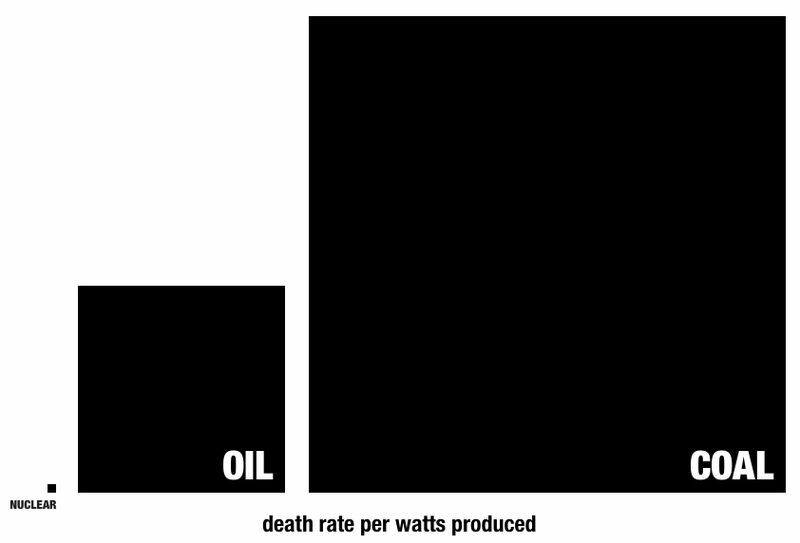 Marketing guru Seth Godin turns data on deaths-per-terawatt of energy produced into an easy-to-understand chart that tells a story that may surprise you. For every person killed by nuclear power generation, 4,000 die due to coal, per unit of energy produced. Vivid is not the same as true. It’s far easier to amplify sudden and horrible outcomes than it is to talk about the slow, grinding reality of day to day strife. That’s just human nature. Not included in this chart are deaths due to global political instability involving oil fields, deaths from coastal flooding and deaths due to environmental impacts yet unmeasured, all of which skew it even more if you think about it. What Godin forgets is that nuclear deaths could greatly increase after Fukushima. Let’s pray that they don’t. But his basic point holds — nuclear accidents are dramatic, like a fiery plane crash, and they grab attention. But many more people die in car accidents than in the air. In the same way, boring old coal lacks the star power of nukes but it’s a much deadlier killer. It’s hard to argue that any of the world’s large-scale energy sources inspire much confidence. Today’s nuclear plants are unsafe in the short run and their waste is dangerous for future generations; tomorrow’s advanced nuclear plants may be a pipe-dream. Conventional oil and gas are running low and unconventionals provide poor, often negative, energy return. Coal means disaster for the global climate and for local coalfield communities. We do need to ramp up truly clean renewables, but it’s likely they’ll only fill part of the gap. This means that people who worry about global warming and peak oil really can only propose one realistic option for society’s energy future: conservation and powering down. Excellent article as always. I was wondering if anybody has done any kind of environmental impact study as to the cost to the environment/ terawatt? Especially all of the mining and mountaintop removal that goes on for the coal and uranium industry. Wind turbines could easily be produced from scrap metals, so would have a much smaller CO2 footprint. With the new technology in screen printing of solar panels, even that has become greener with less original energy input to produce. Matt — very good questions. I wonder if one of the green groups has quantified that, at least for coal and mountain-top removal? And I think the cost to the environment would translate in the long term into human mortality and morbidity, as they say in the healthcare world. As to solar and wind, they could have a much smaller eco-footprint using more recycled materials and components. Also, we should cut some of those transport miles by making more of the equipment in the USA, and soon the rising cost of oil and transportation could make domestic sourcing more cost competitive anyway. I really like this article. I would like to show it to people I know but I am(and know they will be) curious about how you did your math. Could you refer me to any of your sources? Nick — Thanks! There are a couple links in the piece that provide the data, with their own charts and graphs, particularly http://nextbigfuture.com/2011/03/deaths-per-twh-by-energy-source.html, that hopefully have what you need. What concerns me even more about nuclear, oil and coal is not simply the mortality impacts illustrated but also the morbidity…the cases of leukemia, cancers, birth defects and other genetic impacts that don’t actually end up fatal but severely degrade quality of life. Thank you for noting conservation/power down as the only real solution. Nice, a marketing guru makes a easy to understand graph. It is just not serious to take the smallest findable number of death due to the Chernobyl disaster with 4,000 and not even mentioning that other evaluations of studies in different regions sum up to almost 1,000,000 death. Weather all this unexplained increases in death rates are directly to Chernobyl is not clear, but in any case the number of death due to nuclear energy would be driven up with an realistic estimate. Furthermore there is a hidden number of death which are not included in any studies. On the other hand he included all victims of air pollution which can be spotted much easier (it is usually the lung). The problem with nuclear power is that those radioactive material can affect many generations of people. I don’t think genetic diseases are any better than being dead. You’re so right about nuclear waste. We ran a review of an eerily beautiful movie about it (“Nukes are forever”), exploring the creepy nuclear waste depository in Finland. Do not agree with figures. For example, at the Fukushima, Japan nuclear power station, it has been evacuated, people lost everything, for those who did not lose their homes, they most probably cannot return within their lifetimes. Because of the high radiation hospitals had to evacuate their patients, over one hundred died being moved to other locations. With a nuclear power station, it is the long term residual effects that end up causing the most damage, this is not in any graph. The hospitals in Nagasaki are still there, they are still studying the effects of the bombing even after a little less than 70 Years. This article is obviously pro Nuclear, the excuse I always loved was Nuclear power station problems have never killed anyone and it’s true, however the collateral damage and later deaths can be attributed in a large part to those power plants. In Fukushima many people are old and cannot afford to rebuild their lives again, in my opinion, Tokyo Power company stepped on many people like insects all for a profit. Yes, you’re absolutely right that Fukushima has already caused many problems and is likely to cause untold suffering for decades and perhaps centuries to come. I can assure you that I’m not pro-nuclear and I’m pretty sure that Seth Godin isn’t either. It’s just that I think we shouldn’t let a nuclear crisis, no matter how big, distract us from the most dangerous source of energy today for the climate: coal. And now, if the world is going to reduce its reliance on nukes, we certainly shouldn’t replace it with coal. 4,000 is the scientific study on Chernobyl. 1,000,000 is the propaganda number for Chernobyl. But I’m willing to accept it. Nuclear maybe 250 times more destructive than the scientific numbers indicate. That would make coal only 16 times more dangerous than nuclear, which would barely be 25% safer than oil. And that’s for a reactor with no containment vessel or safety equipment. In Three Mile Island and Fukushima the meltdowns were safely contained in the reactor vessels. The problem at Fukushima was that the anti-nuke activists kept the waste from being removed from the plant and sealed safely away, so when the water dried out the waste burned and released a radioactive plume. Even then there are no known cases of significant exposure among the civilian population, and most of the area is safe for habitation. There are a few hot spots to clean up, and the residual contamination is rapidly decaying. The principal problem is, once again, the remarkable human talent for panic and exaggeration.